Candy Matson was no girl detective ... she was all woman. 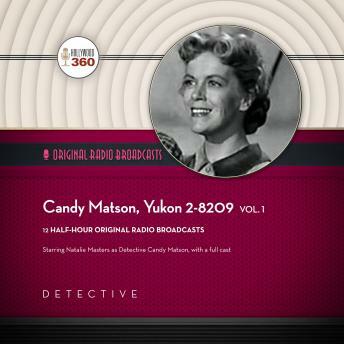 Candy Matson was a response to all the hard-boiled detectives on the radio like Philip Marlowe, Sam Spade, and Pat Novak, and all those other detectives who were beaten up on a regular basis. Candy, played by Natalie Park, was hard-boiled in her own way. She never compromised her femininity but she did know how to use a gun and didn't hesitate to use it when it was necessary. She didn't take any guff from the guys-the good guys or the bad guys. With a snappy comeback, she could take anybody's head off. Candy was fearless, never hesitating to go wherever she needed to solve a case from the lowest dive to the classiest nightclub. Candy worked hard to get her goon. Men orbited around her like she was the sun. Her best friend and partner in detection was Rembrandt Watson, a flamboyant photographer. All private detectives need a police detective foil and, in Candy's case, that was Lt. Ray Mallard. It didn't hurt that Mallard was easy on the eyes (plus she and the good detective dated). Candy Matson aired on NBC from 1949 until 1951 and was a regional success. Natalie Park Masters starred as Candy, and her husband, Monty Masters, wrote the show. Episodes included are: "Donna Dunham Case," "The Fort Ord Story," "The Devil in the Deep Freeze," "Jack Frost," "Insurance Crash," "Eric Spaulding Concert," "Symphony of Death," "The Movie Company," "The Egyptian Amulet," "San Juan Bautista," "Candy's Last Case," and "Fortune Teller."